I’ve often done software training on the Canon software utilities that come free with each camera, it’s often a surprise for photographers to find that tethered shooting and remote control is not only possible but already included with the camera. If only folks actually opened the manual pack and got the CD out! 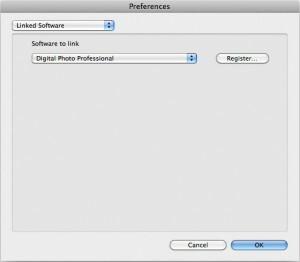 Since a lot of professional photographers working in the studio are on an Apple computer then this is the way to streamline and optimise your software settings for tethered shooting just by plugging the camera in to the computer. You can do similar with a PC. You actually only need to install the EOS Utility to do tethered shooting, though I usually add Digital Photo Professional since I like it for processing RAW files. You need to install from the CD once, regardless of how old your CD is then if needed you can download the latest version of the EOS Utility from Canon, the downloads are updaters and won’t install without a previous version already on your computer. Most likely after the install you were prompted to restart the computer, and if you did then you should get the standard EOS Utility startup or even the Canon ImageBrowser software if you installed everything from the CD. Assuming EOS Utility starts, if it doesn’t then start it from the dock, you will get a screen like the one to the left. You need to select the prefrences and make some changes to EOS Utility so that it starts in Camera Settings / Remote Shooting by default. In the preferences of EOS Utility you need to first change the startup function in the basic settings. Set this to Show [Camera settings/Remote shooting] screen as shown. If you want to tether and have the images pop up in Lightroom or Digital Photo Professional make sure to untick the Automatically display Quick Preview window aswell. The last part is to decide what happens when an image you shoot arrives on your computer. 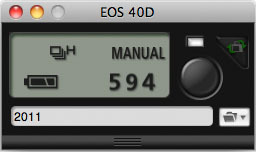 EOS Utility can wake up either Digital Photo Professional and show the images in that or do nothing further. If you want to shoot tethered in to Lightroom choose nothing then let Lightroom look at the folder the images arrive in and automatically show them and add them to the catalogue. 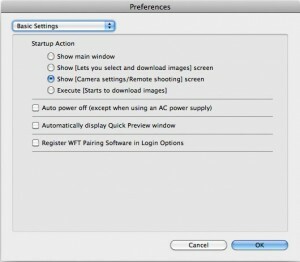 There are other settings you might want to change, such as the folder nameing and filenaming that EOS Utility can apply. I like to get EOS Utility to rename my files and organise them for me, but I’ll explain more in another post. Apple has an application called Image Capture that determines what happens when events related to cameras and memory cards happen. So I suggest that you configure Image Capture to start EOS Utility as soon as the computer detects the camera is connected. You can find Image Capture on your Mac using the spotlight search. With your camera connected the Devices section will show the camera model, click on it to highlight it, and then look at the lower left corner of the window, this is what the computer will do when that model of camera is connected. If you installed from the CD then likely it says CameraWindow like the screenshot, but I suggest you change that to EOS Utility. EOS Utility should be in your Applications > Canon Utilities > EOS Utility folder on your Mac. 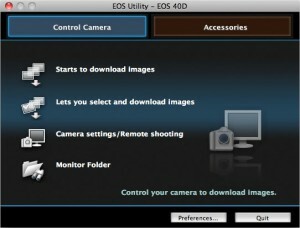 Now when you plug in and switch on your camera EOS Utility will start automatically and be ready to be transferring images from the camera to the computer. You can make changes to the camera settings and even take pictures from the computer. Clicking on the pattern of lines at the bottom of the EOS Utility window will switch the window to a smaller more compact version as shown. Now when you plug-in your camera your computer will automatically be ready for tethered shooting. I suppose tethering both on Nikon and Canon on the same shoot is a bit of handful equipment wise so you have to pick one or the other. Seemingly though I understand someone who only shoots using black lenses may of been suitably impressed with the competition? It didn’t matter he was already converted by the quality of the Canon, plus as you shoot then you get a copy on a card in the camera AND on the computer. The other brand seems to only put the files on the computer when shooting tethered. On the ‘black lenses’ front he was kept happy with a nice black EF 135mm f/2L USM. The studio shoot did inspire the blog post, though it’s one I’d had in mind for a while. Is there a way to do this into Lightroom 5.3 on a 6D ? I have a 6D, and there doesn’t seem to be a way to shoot tethered to an iPad. I can use the app, but I have to trigger the picture from the App, whereas what I want to be able to do is shoot in normal SLR mode, but automatically transfer the image to the iPad so I can review it etc. Have you tried taking the app out of remote control mode, and just viewing the images on the camera mode and then taking pictures? (I’ve not got a 6D to hand so can’t test this out). Hello. I was wondering if you could help me. I have a tethered set up with a MacBook and a canon 650D. I am using studio strobes but whenever I plug an external monitor the flash stops firing. Any ideas what might cause this? It flashes when I plug the monitor into the laptop then not again thank you for any help. Luke. Great question, I think that this is possibly a Live View related issue. If you plug the monitor in to the camera’s HDMI port and use Live View then you may find you can’t trigger your studio lights. However if you tether the camera to a computer running EOS Utility and plug the monitor in to the laptop then you can trigger the lights. In the manual for the EOS 650D it says that if the camera is used with a non-Canon flash – like a radio trigger for your studio lights – then the flash will not fire during Live View mode.